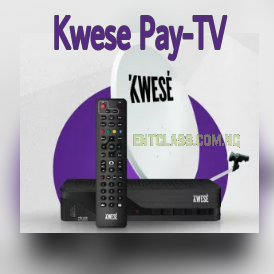 Zimbabwean owned Pay TV Kwese has been officially launched in Nigeria, after being available in other African countries like Rwanda, Zambia and Ghana. This new satellite TV might sound new to many of us, and at the same time surprised of its fast launch in Nigeria when we are still waiting for TStv to begin operation. Kwese TV is the latest Pay-TV satellite in Nigeria. It's here to compete with the likes of Gotv, DStv, Startimes including TStv. The new Kwesé TV comes with premium entertainment channels, international and African series and movies, award-winning children’s entertainment channels and some sports channels. You might want to buy the new Pay-TV but before you do, here are some things you need to know about the newly launched Kwese TV. For more information about the new Pay-TV, kindly visit their website at www.kwese.com. What's your say on this new Pay TV? Kwese pay TV dead on arrival, nobody would go for their subscriptions. The owner of this TV does not know what is on ground in Nigeria, their subs too high. wow every body just want to introduce he/her dercorder for everyone to buy. Come on, what is this? I like the competition but I would rather stick to Dstv than this. The content is too wacky men. They dont really seem ready for bussiness here. Ni am liking this competition. See as everyone is introducing pay per day sub. DSTV has taken this country for a ride for far toooo long. Go and try other countries..